5 Seconds Of Summer. Are they Pop? Are they Rock? Who knows? Who really cares? What we really care about is that their debut, self-titled album has finally dropped. After the incredible amount of hype built around the band courtesy of their two huge singles, "She Looks So Perfect" and "Don’t Stop" the excitement for the band’s debut has reached fever level, but does it live up to the hype? 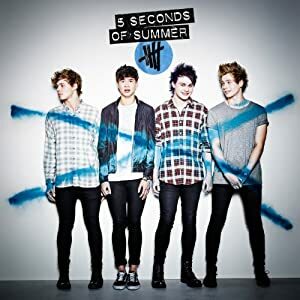 The album opens in a tremendous fashion, launching into the single that made them the well-established band that they are now, "She Looks So Perfect" is still one of the strongest pop songs to come out of the past six months and "Don’t Stop" - it’s follower, has proved that 5 Seconds Of Summer are going to be more than a one-hit-wonder. Back when ATP! spoke to the guys in 5 Seconds Of Summer, they told us they’d been working and writing with All Time Low and The Madden Brothers, amongst others on the album and these influences have certainly filtered through into the tracks on this album. "Good Girls" has got an early Good Charlotte, pop/rock anthem feel to it. The guitar chords are chunky and the chorus is HUGE, like, really huge. "Kiss Me Kiss Me" and "18" continue the up-beat, positive vibe that has flowed throughout the album so far. It reminds us that they are just four young, cheeky guys and they want their music to be fun, which this debut has most certainly showed. "Everything I Didn’t Say" brings us the power anthem that every album needs. The first half of the album goes full throttle, throwing us into a 5SOS frenzy of upbeat pop choruses to please the millions. "Everything I Didn’t Say" takes a slightly different path, more of an Imagine Dragons style, with plenty of “woah-oh’s” to keep listeners content. Oh and what’s this, a little romance coming through in "Beside You"? The charmers. This’ll get the girls all up in a fluster, guaranteed. Enough of the soppiness, the album kicks right back into gear with "End Up Here," quoting Bon Jovi and throwing handclaps in is always a winner in our books. It brings back those sunshine-pop melodies that 5SOS are just really great at creating, (with a little help from their friends). "Heartbreak Girl" is one of our final appetizers in this sweet-filled delight of an album, whipping us up into a giant 5 Seconds Of Summer musical pudding. Yes, it may be a little TOO sweet but that doesn’t mean we won’t stop coming back for more. There’s been an awful lot of discussion about the boys in 5 Seconds Of Summer recently, and it seems a lot of people can’t make up their mind on the band, a bit like Mikey not having a clue what color to dye his hair next. Just take them as they are, four guys living out their dream by playing their instruments and dominating stages across the world with their pop/rock melodies. 5 Seconds Of Summer's self-titled debut album will be released on July 22nd (US/Canada) // June 30th (UK) // June 27th (Australia) via Capitol Records.